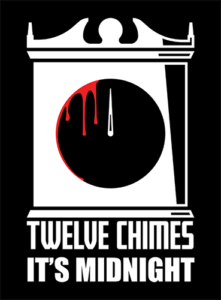 Twelve Chimes, It’s Midnight – Original old-time-radio style dramas. 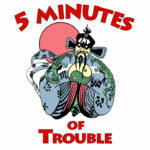 5 Minutes of Trouble – Discussing John Carpenter’s “Big Trouble in Little China” 5 minutes at a time. 5 Minutes of Banzai – Discussing the W.D. Richter cult classic “The Adventures of Buckaroo Banzai Across the Eighth Dimension” 5 minutes at a time. Indiana Jones Minute – Discussing the “Indiana Jones” movies 1 minute at a time. Groundhog Minute – Discussing the Harold Ramis film “Groundhog Day” 1 minute at a time. The Thing Minute – Discussing the John Carpenter film “The Thing” 1 minute at a time. 5 Minutes of Mystery – Discussing the film “Mystery Men” 5 minutes at a time. The Fifth Eleminute – Discussing the film “The Fifth Element” 1 minute at a time. The Princess Bride Minute – Discussing the Rob Reiner film “The Princess Bride” 1 minute at a time. Star Trek Minute – Discussing the “Star Trek” movies 1 minute at a time.